ST PETERSBURG, FL October 17, 2017 – Work-life balance, open salaries, and unlimited vacation have been part of travel insurance comparison site, Squaremouth since it was started. This year, those perks earned Squaremouth recognition as one of Fortune Magazine’s 50 Best Small Workplaces in America for the second time in three years. Squaremouth CEO and Co-Founder Chris Harvey believes clocking out at 5 pm, open salaries, and company perks help maintain passionate and engaged workers. Work-life balance has always been an important company aspect that isn’t taken lightly. “We don’t have plaques with our core values. We live our culture and values every day. The people who do really well here are the ones who want their colleagues to do well. Squaremouth employees are kind and driven and want to succeed as much as they want others to succeed,” says Harvey. 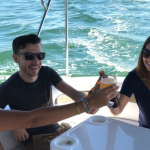 Unlimited paid vacation, beer fridges, catered lunches, and a company boat are all popular benefits at the award-winning company. Transparency extends throughout everything the company does. From the open office layout to open salaries, Squaremouth’s culture instills collaboration and intrinsic motivation throughout. Important company decisions, like raises and employee hires, come down to a vote. Squaremouth has earned multiple awards over the years for company culture and customer service. The company has been named the No 2. Workplace for Women in the Nation, International Customer Service Department of the Year and one of Inc. Magazine’s Best Workplaces. Awards in company culture and customer service are what make Squaremouth one of Inc.’s 5000 Fastest Growing Companies for five years in a row.